Confocal immunofluorescent analysis of lymph node from a syngeneic CT26 tumor-bearing mouse. Sections were labeled with PD-1 (D7D5W) XP® Rabbit mAb (Mouse Specific) (Alexa Fluor® 594) (red) and Ki-67 (D3B5) Rabbit mAb (Alexa Fluor® 488 Conjugate) #11882 (green) before mounting with Prolong® Gold Antifade Reagent with DAPI #8961 (blue). 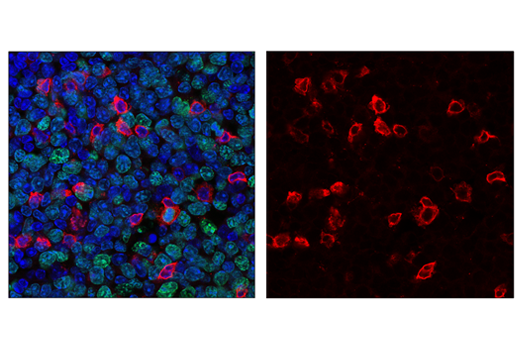 Confocal immunofluorescent analysis of EL-4 cells (left, positive) and NIH/3T3 (right, negative) using PD-1 (D7D5W) XP® Rabbit mAb (Mouse Specific) (Alexa Fluor® 594 Conjugate) (red). Blue = Hoechst 33342 #4082 (fluorescent DNA dye). PD-1 (D7D5W) XP® Rabbit mAb (Mouse Specific) (Alexa Fluor® 594 Conjugate) recognizes endogenous levels of total PD-1 protein. 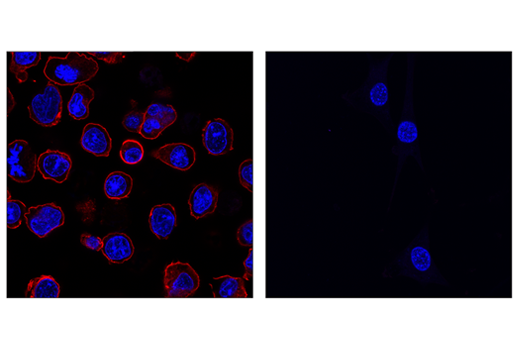 This Cell Signaling Technology antibody is conjugated to Alexa Fluor® 594 fluorescent dye and tested in-house for direct immunofluorescent analysis in mouse cells. This antibody is expected to exhibit the same species cross-reactivity as the unconjugated PD-1 (D7D5W) XP® Rabbit mAb (Mouse Specific) #84651.